When Vania moves from Australia to Summerland, California, the last thing she expects to feel is that she's come home. Maybe it's Summerland's unusual history - Vania is drawn to stories about magic and witchcraft and, as she discovers, this pretty coastal town was settled by Spiritualists. And Vania's not the only teenager in town interested in magic. There are a few others including good-looking class president Bryce. Together they form a coven but when they use their powers to investigate a local mystery, something goes wrong. Vania knows that the coven's power is good but there is evil out there too. Something or someone is determined to hunt them down. What does this force want with the coven? What price will Vania have to pay for the truth? 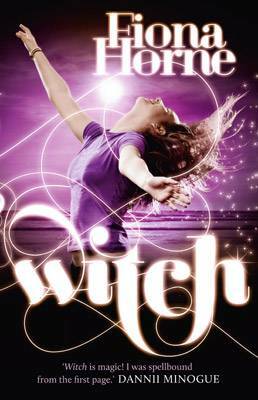 Australian-born Fiona Horne is the author of several best-selling books on witchcraft and magic including Witch: A Personal Journey. She became famous in the 1990s as the lead singer of Australian bank Def FX. She is also a radio and television personality, actress and a worldwide authority on Modern Witchcraft. Fiona lives in California in the United States. Question: What inspired you to write Witch? Fiona Horne: After many nonfiction books about Witchcraft I was excited to write something with more creative freedom like fiction. The idea for Witch (and the following two books in the series which I hope will be published) had been brewing in my head for some time. I would have dreams about the main character Vania and I knew I needed to get her out of my head and onto the page. Question: Did you draw on your own experience of moving to California from Australia for Witch? Fiona Horne: Yes, the book is set in the town of Summerland and I remember being excited the first time I drove up the coast of California from Los Angeles to Santa Barbara many years ago and seeing signs for 'Summerland'. In Witchcraft, some consider 'Summerland' to be the 'witches' heaven'! And I thought, 'Oh I'm actually in heaven!' It was fun visiting the town again during the writing of my book and researching its historical origins and using what I found to set the scene for Vania's adventures. Question: How does it feel to have Danni Minogue love your book? Fiona Horne: I have been friends with Dan for nearly fifteen years! And she is an honest friend and I trust her judgement and opinion and so I am especially thrilled that she enjoyed my book enough to give it the thumbs up. Especially as having recently completed two books herself she really understands the work that goes into writing and editing. Question: What was the best thing about creating the character of Vania? Fiona Horne: I got to iron out some of the kinks of my own teen years and experiences that were still stored in my head as I drew on them to create Vania. But as much as she was influenced by my adolescence, she really did take on a life of her own as the book grew and I felt like I was following her rather than creating her and just trying to write down everything she did - it was exciting and fun! Question: What do you enjoy most about writing magic and witchcraft for a young adult audience? Fiona Horne: I hope that I can inspire young adults to experience life as a positive magical adventure - teen years can be challenging and difficult - after all there is that saying 'youth is wasted on the young'. I would hope that my writing inspires my young adult readers to love themselves and love their lives and live them to the fullest.